A riot of colours and sharp edgy silhouettes mark the clothes designed by the young and exuberant Altynai Ozmoeva from Kyrgyzstan. The designer grew up in an atmosphere where the traditional arts and crafts of her homeland were always being celebrated. “My grandmother was a craftswoman and she imbued in me the love for our ancient crafts and textiles. My mother, Dinara Chochunbaeva is associated with the Central Asian Craft Support Association Resource Center. So when it came to the decision of a career, I knew I had to do something in the field of our traditional crafts. I have always loved textiles and the richness of Ikat from all across the globe has enticed me for many years now”, says Osmoeva excitedly, dressed in a smart Ikat dress herself. She reveals that the dress is self-designed from an heirloom Patola dupatta gifted to her by a friend from India. “India’s textile history is extremely rich. 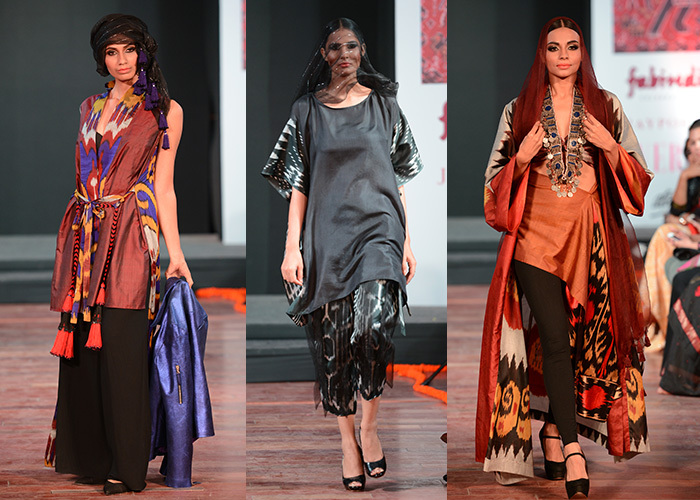 Sadly, we do not wear saris back home hence I give our Uzbek ikats a contemporary edge through these silhouettes as well as layering the traditional weaves with leather and other modish material,” she says. 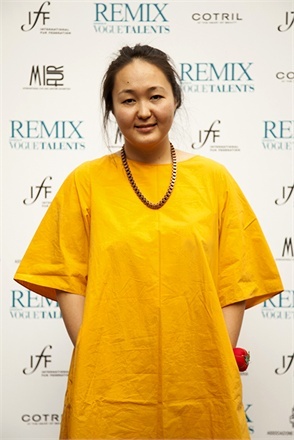 The young designer studied womenswear in Central St Martin’s in London to hone her knowledge about the industry before getting into the detailed world of Ikat from the Uzbekistan and Tajikistan regions around her home country. “In our country, we do not make Ikat per se and the weaves are mostly done on felt. But I wanted to work with the mulberry silk version that is so luxurious to wear. The beauty of the Ikat industry is that the weavers take immense pride in creating these masterpieces which we try to bring out through our work”, she finishes.